We hit the big 100 while enjoying an overseas vacation, with less time and opportunity to closely follow Palmeiras. That means less individual game reporting, but certainly a weekly compilation of news, your well-known “sonar pings”. Since last time, Palmeiras played Grêmio away and Flamengo at home, both games ending in draws. Playing the gaúchos away is always hard and this time was no exception, even with the Porto Alegre team free falling. Considering what the two brought to the pitch, the draw should be considered a good result. 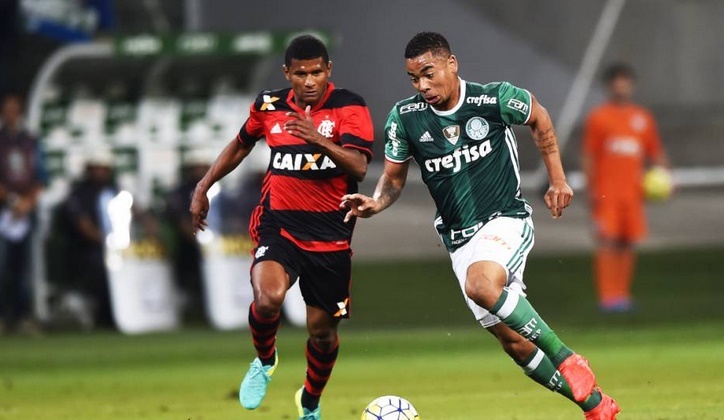 In addition, no Palmeiras player saw the third yellow, meaning full strength at Cuca’s disposal against runners-up Flamengo previous Wednesday – by many (incorrectly) considered a decisive game, the game to define the championship. With 13 rounds to go, only a few points separating Palmeiras and Flamengo and several other major clubs fighting for title and/or a Libertadores spot, anything is possible, regardless of how last Wednesday did or did not play out. The Allianz Parque was not packed against the cariocas, as the Supreme Tribunal of Sports have slapped a penalty on Palmeiras for the clash between Flamengo and Palmeiras ultras in Brasilia earlier this year: 5 home games with the North Sector empty (the most popular prized sector, and where Palmeiras’ organised supporters traditionally attend the games) and five away games without any ticket rights. Never mind Flamengo, as home team, were responsible for security at the Mané Garrincha stadium in Brasilia. Never mind there are uncertainties regarding how the fighting started. True, Flamengo were also punished, but not as severely. The game itself was a tense affair. Apart from the initial 15 minutes, Palmeiras had the upper hand, creating more chances, especially after the sending off of Márcio Araújo. Even so, lack of attention permitted Flamengo to open up the scorecard, the Lex Ex again taking its toll after a well-placed shot by former Palmeiras player Alan Patrick. Coach Cuca acted rapidly, promoting Barrios and Marques on Gabriel and Guedes, and later Cleiton Xavier on Tchê. The all-or-nothing approach resulted in tremendous pressure and with ten minutes left, Gabriel Jesus scored the equaliser. Palmeiras looked set on turning things around, but the sand ended up running a bit too fast through the hourglass. The result maintains Palmeiras in the lead, one point ahead of Flamengo. Yesterday, the 25th round was completed as third-placed Atlético Mineiro beat Sport to close in on the leader, now only three point ahead. Palmeiras’ much superior goal balance could prove decisive (knock on wood: we need no heart attack scenarios). Palmeiras have withdrawn to the training grounds in Atibaia, all focus on Saturday’s derby against Corinthians. Cuca has already signalled Edu Dracena as Vítor Hugo’s replacement, the centre back suspended after receiving his third yellow against Flamengo. Also Gabriel Jesus saw his third yellow, but Cuca has not yet indicated his preference, likely keeping it a secret until the last minute. My guess is we will have Erik back in the starting eleven.